ÆTHELBERT I (ETHELBERT, ALBERT) of KENT, the first Christian English king, St. Æthelbert was married to Bertha of France. King St. Æthelbert welcomed the mission led by St. Augustine (27th May) in 597 and is believed to have been baptised by him that same year. He founded Canterbury and Rochester Cathedrals, as well as St. Paul’s, London. King St. Æthelbert reposed 616, and was buried in the abbey, which he had also built, at Canterbury. BETTO, a monk at Sainte Colombe in Sens in Burgundy, who was consecrated Bishop of Auxerre in 889, serving that See until his repose in 918. 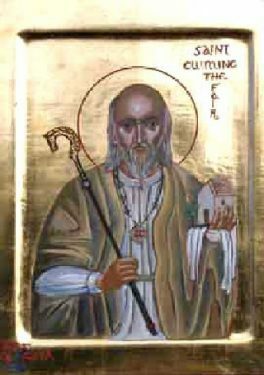 CUMINE the WHITE, (also 6th October), an Irishman who served as Abbot of Iona, St. Cumine also wrote a Life of St. Columba of Iona (9th June). He reposed in 669. JOHN THERISTUS (The HARVESTER), having killed his father, Saracens then enslaved St. John’s pregnant mother. They transported her from Calabria to Sicily where St. John was born. In his early teens, St. John managed to escape and travelled from Sicily to Calabria where he received monastic tonsured. Once, when a devastating storm was approaching which would have destroyed the neighbouring crops, St. John miraculously harvested the crop, saving the local community from starvation, and earning the sobriquet ‘Theristus’. St. John reposed in 1129. LIUDHARD (LETARD), St. Liudhard was the French bishop of unknown See — though Butler, and some others assert that he had been Bishop of Senlis in Picardy — who accompanied Queen Bertha to Kent on the occasion of her marriage to King St. Æthelbert (vide supra). As with so many of his contemporaries, few definite facts are known of his life, though it is safe to assume he did have a role in ensuring the warm welcome given to St. Augustine of Canterbury (27th May) and his fellow missionaries. St. Liudhard reposed circa 600. MODESTUS, the twenty-first Bishop of Trier from 486 until his repose in 489. He successfully led his flock through the difficult period when the city came under Frankish rule. His relics are enshrined in the church of St. Matthias in Trier. MONTANUS, LUCIUS, JULIAN, VICTORICUS, FLAVIAN, and COMPANIONS, a group of ten disciples of St. Cyprian of Carthage (16th September), martyred in 259 in the persecution of Christians during the reign of Valerian. The first part of their Acts consists of a prison diary kept by the martyrs, and the second part eyewitness accounts of their martyrdom. PRAETEXTATUS (PRIX), the seventeenth Bishop of Rouen from 550 to 586. His rebukes of the scandalous behaviour of Queen led to his persecution and exile, though he was reinstalled seven years later. However, he continued to reprimand the Queen who had him assassinated on Easter Sunday 586 on the steps to the altar of his cathedral. PRIMITIVA (PRIMITIVUS), (Date Unknown), an early martyr in Rome, of whom no further information is extent.